Back for a second season, it’s finally robot-fighting time! Season 2 of BattleBots began with the preview special, The Gears Awaken. More than 300 teams from 13 countries applied to enter the competition for The Giant Nut, and as a result, the size of the tournament doubled this year, with 44 robots previously entered into the competition. In this episode, the selection committee decided the best way for 12 evenly matched robots to be chosen for the final four entry slots is to battle it out. Think of this as the “First Four” or play-in game of March Madness… or a robotic battle royale. Four “rumbles” of three robots were on display and through each battle, there was plenty of carnage on display. The robotic competitors included: Son of Whyachi, Creepy Crawlies, Ultraviolent, Basilisk, Blacksmith, Gemini, Invader, Lycan, Bad Kitty, Skorpios and Black Ice. Smoke, sparks, a flaming hammer and a drone led to redemption, along with rookie upset win. Son of Whyachi, Black Ice, Mohawk and Blacksmith join 44 other teams in a battle to dethrone last year’s defending champion, Bite Force. 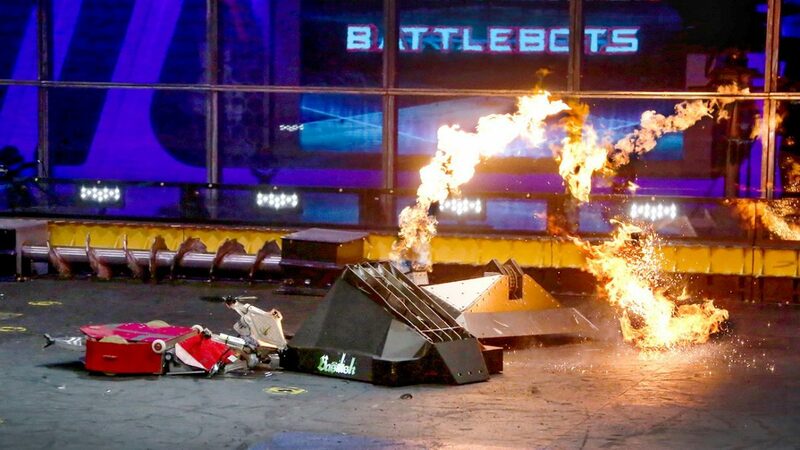 Without much pre-show publicity, we were more than a little surprised when BattleBots appeared in our DVR. As one of our favorite TV shows, we enjoy the robotic carnage and competition aspects, but feel like the show’s producers waste too much time showing the commentators on screen, instead of the robots (which is the main draw of the show). Commentators are meant to be heard, not seen. If their screen time can be dramatically reduced, we would have virtually no qualms with the show. BattleBots returns with its full tournament scheduled to begin on Thursday, June 23rd, airing on ABC.